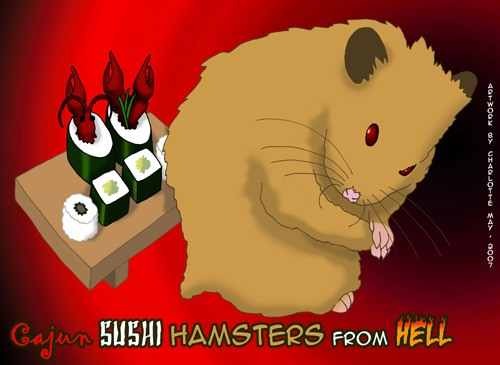 The "Cajun Sushi Hamsters" (sometimes less frivolously known as the "Cleveland Science Fiction Writers Workshop") is a science fiction and fantasy writers' workshop based in Cleveland, Ohio and the surrounding area. We meet roughly once per month to critique manuscripts. The workshop critiquing is done in the Clarion style. The workshop's purpose is to be a professional-level workshop; that is, we are not engaged in teaching a "how-to" workshop on writing, but endeavor to give feedback in the form of comments, criticisms, and suggestions suitable to a writer working on a professional level. Membership is by invitation, and workshop meetings are not open to the public. However, we are always looking for excellent new writers to join the group. For another view of the hamsters, Steve Swiniarski has an excellent article about the workshop on his home page. "No Fear of Rejection" (a new general-interest writers workshop in Cleveland). This page currently lives on the Critters server, courtesy of Andrew Burt.